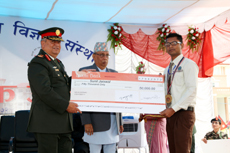 Nepalese Army Institute of Health Sciences (NAIHS) celebrated its third anniversary amid a special program organized in its premises at Bhandarkhal, Sanobharyang on August 2, 2015. The Chief Guest of the program was General Gaurav S. J. B. Rana, Chief of Army Staff of Nepalese Army. Former CoASs, high-ranking military and police officials, dignitaries from other medical institutions, Institute of Medicine, Tribhuvan University, and Nepal Medical Council, and faculty members, staffs, and students of NAIHS attended the program. 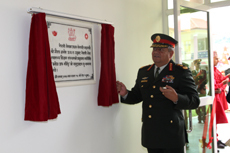 At the beginning of the program, CoAS Gen. Rana inaugurated the Girls' Hostel of NAIHS-College of Medicine, the Complex of NAIHS-College of Nursing, and the Complex of NAIHS-College of Medical Polytechnic. Brig. Gen. (Rtd.) Prof. Dr. B. K. Hamal, Deputy Executive Director of NAIHS, initiated the formal program with a welcome speech. Maj. Gen. (Rtd.) Prof. Dr. Prakash Raj Pande, Executive Director of NAIHS, presented the annual report highlighting the achievements of the institute and its forthcoming projects. Prof. Dr. Gunnidhi Neupane, Rector of Tribhuvan University, Prof. Dr. Dharmakanta Baskota, President of Nepal Medical Council, and Prof. Dr. Bimal Kumar Sinha, Dean of Institute of Medicine of Tribhuvan University congratulated the NAIHS family on its third anniversary. During the program, CoAS Gen. Rana distributed running shields to the representatives of the houses with excellent record in annual sports events. Ms. Gyanu Prajapati and Ms. Sapana Parajuli, on behalf of the Red House of College of Nursing of NAIHS, received the running shield for the excellent performance of the members of the Red House in the annual sports week of College of Nursing of NAIHS. Similarly, Mr. Pramod Kadariya and Ms. Shweta Karna, on behalf of the Red House of College of Medicine of NAIHS, received the running shield for the excellent performance of the members of the Red House in the annual sports week of College of Medicine of NAIHS. CoAS Gen. Rana bestowed awards, mementos, and cash prizes upon the students of College of Nursing of NAIHS with excellent records in academics, discipline, and extracurricular activities. Ms. Sabina Shrestha was the recipient of the Best Student of the Year Award in PCL Nursing stream. Ms. Sumana Thapa received the Best Student of the Year Award in B.Sc. Nursing stream. Similarly, the Best Student of the Year Award in Bachelor in Nursing Science (BNS) stream was grabbed by Ms. Anju Kumari Sharma. CoAS Gen. Rana also awarded the excellent students of College of Medicine of NAIHS with medals, mementos and cash prizes. Ms. Shreya Shrestha received Late Prof. Dr. R. P. Upadhyay Memorial Gold Medal for her excellent performance in the subject of Clinical Anatomy. Ms. Rajshree Singh was awarded the Best Student of the Year for her excellent all-rounded performance. The most coveted CoAS Academic Excellence Gold Medal was received by Mr. Sunil Jaiswal for his excellent academic record in Integrated Basic Medical Sciences. 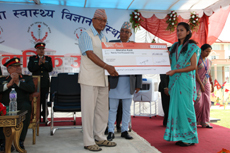 Mr. Dil Bikash Rajbhandari, the husband of Late Lt. Col. Shasikala Rajbhandari, former Matron of Shree Birendra Hospital, awarded Ms. Manisha Karki, a graduate of PCL program of College of Nursing of NAIHS, with Late Lt. Col. (Rtd.) Shasikala Rajbhandari Memorial Gold Medal for her excellent all-rounded performance. On his congratulatory speech, CoAS Gen. Rana lauded the faculty members and the students of NAIHS for their diligence in producing excellent results among the various medical and nursing colleges. CoAS Gen. Rana also thanked and congratulated the entire NAIHS family on their efforts in making NAIHS a prime medical education institute in the country within a short span of time. 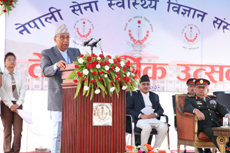 He highlighted the vision of Nepalese Army to develop NAIHS as the 'Centre of Excellence’ in the field of medical education in Nepal by expanding its services and facilities. Brig. Gen. Prof. Dr. Narbada Thapa, Principal of College of Nursing, closed the formal program with a vote of thanks. The guests and the members of NAIHS family interacted with each other in a lunch session that followed the formal program. Ms. Sukriti Maharjan, a student from College of Medicine and Ms. Alisha Neupane, a student from College of Nursing anchored the program.